Taylor Swift's Tennessee endorsement matters. But so do all the years she stayed on the political sidelines. The pop star's change of heart is a step in the right direction — but what took her so long? The Senate confirmation of Brett Kavanaugh over the weekend dealt a serious blow to the #MeToo movement, with the GOP’s overarching message boiling down to something along the lines of: “We hear you, women, and we don’t care.” Liberal activists responded with pleas to support feminist candidates in the midterms. But one endorsement in particular has cut through the noise: a post on Instagram endorsing Democratic Senate candidate Phil Bredesen. Bredesen, who is currently trailing Republican opponent Marsha Blackburn by up to eight points in the polls, can use all the help he can get. But the post has made national headlines more for who was doing the endorsing: superstar artist Taylor Swift. Swift is one of our generation’s more complicated celebrities. Blonde and blue-eyed, the waiflike prodigy took the country music world by storm at age 15. Her songs spoke to a generation of young people, but especially women. It was music that felt genuinely written for them, by one of their own. But Swift’s innocent ingénue persona also became a trap of her own making. Hating on Swift became something of an internet meme. And any scandal that involved her, including the infamous Kanye West VMAs episode, portrayed her as a victim. True or not, it’s a theme that still runs through her albums, even though she’s now nearly 30 years old with a net worth reportedly over a quarter of a billion dollars. In recent years, Swift has mostly ditched her country origins for the pop charts. But one thing that has stayed the same is her avoidance of politics. In recent years, Swift has mostly ditched her country origins for the pop charts. But one thing that has stayed the same is her avoidance of politics. Her announcement is ultimately a welcome one, but it’s hard to discern what took her so long. Was she just afraid to express her opinion, lest it draw focus from her music? Was she worried being overtly liberal would hurt her album sales? Or did it finally dawn on her that speaking out would do her brand more good than ill? The latter scenarios may sound cynical, but Swift's power has always stemmed as much from her personal brand as from her musical talent. Even as she transitioned to pop music, Swift has maintained a core group of fans who listen to country music and live in red states and watch Fox News. This means her career has long straddled the political divide — and in the end, everyone’s dollars are still green. Whether due to her own preference or the advice of her team, Swift has worked hard to maintain this apolitical middle ground. To be fair, it used to be a big deal when a musician — or any celebrity — took a strong political stand. John Lennon’s leftist stance was once viewed as radical. I remember as a teenager in the 1990s, people sneered at Barbra Streisand for supporting President Bill Clinton. Even MTV’s 1992 “Rock the Vote” was extraordinarily neutral by today’s standards. Expressing political beliefs was believed to hurt your bottom line. This message was reinforced by the chaos that ensued after the Dixie Chicks made a single anti-George W. Bush comment in 2002, transforming the popular trio into the poster children for musicians who don't know when to shut up. Swift was 13 in 2003, already working her way into the music business, and what happened to the Dixie Chicks could well have contributed to her decision to keep her nose clean. But the world changed a lot between 2003 and 2016. By the time Hillary Clinton and Donald Trump were sizing each other up in debates, celebrities were no longer jeopardizing their careers by taking political stands. And certainly not celebrities of her massive stature. Indeed very few artists, male or female, have entered the elite circle Swift is now part of. But of those who have, she is almost completely alone in maintaining her neutrality. Beyoncé was out there openly supporting Black Lives Matter and performing in front of a backdrop that read FEMINIST. Katy Perry dropped everything and went on tour with Hillary Clinton for a year. The Kardashian family, which has never done anything that didn’t have a clear monetary upside, took sides on their reality show. Khloe declared herself a Hillary fan, even as Caitlyn Jenner once supported Trump. Taking a stand in 2016 was all the rage. Even pop stars like Britney Spears, who once was filmed mindlessly saying “We should just trust our President” about the Iraq War, put out an Instagram post of her own gushing over meeting Hillary. At best, Swift’s apathy sent a troubling message in an era when voting is more important than ever. But at worst, Swift’s silence could be viewed as the silence of that segment of Americans who just don’t care about the impact of Trump’s policies, because they aren’t personally impacted by them. 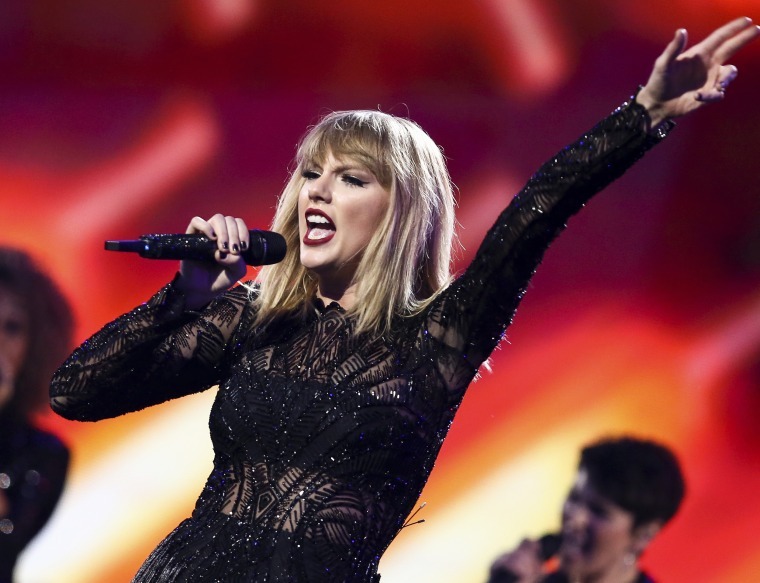 Critics even accused her of pandering to the alt-right, suggesting her looks made her a “Nazi Idol” — Swift’s refusal to rebut even this far-fetched rumor was confusing to say the least. Although it’s unclear what kind of impact her Instagram will have on the Tennessee election, Swift’s declaration this weekend does matter. Liberals must be pleased that someone with potential influence in the conservative community working to break through the partisan barrier. This, despite the fact that Swift doesn’t even really live in Tennessee anymore — though she still maintains a home in the Nashville suburbs like many successful country stars. Now more than ever it's important to talk about what you believe and why; we need to state for the record that we reject the policies that President Donald Trump and his government are enacting in our name. When Anita Hill spoke up in 1991, it was the catalyst for the first large cohort of women in the Senate, and sparked a new wave of feminism after the 1980's anti-feminist backlash. Similarly, we should celebrate the fact that Swift has finally ended her silence. Although it's useless to speculate, it seems likely that Swift's emotional, very personal brush with the #MeToo movement in 2017 contributed to her speaking out now. Perhaps it is proof that the battle over Kavanaugh’s confirmation will result in yet another push toward progress. But let’s also not forget those who have been speaking out for years — many at much greater personal risk. Intersectional feminism means giving credit where credit is due, but it also means not falling back into the habit — too often adopted by white men — of only paying attention to things once white women champion them. Welcome to the resistance, Taylor, but always remember that you are part of a much larger chorus. CORRECTION (Oct. 9, 2018 2:45 p.m. ET): An earlier version of this article misstated the year the Dixie Chicks criticized President Bush during a London concert. It was 2003, not 2002.